Heat oven to 375°F. 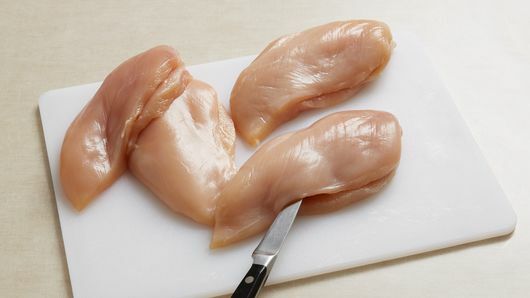 To form pocket in each chicken breast, cut 3-inch-long slit in thick side of each breast, cutting into breast about 2 inches and to within 1/2 inch of opposite side. In small bowl, mix cheese and ham. Spoon evenly into pockets in chicken; secure openings with toothpicks. Place melted butter in shallow dish. Place bread crumbs on large plate. Dip each stuffed chicken breast into butter; roll in bread crumbs to coat. Place in ungreased 13x9-inch (3-quart) glass baking dish. 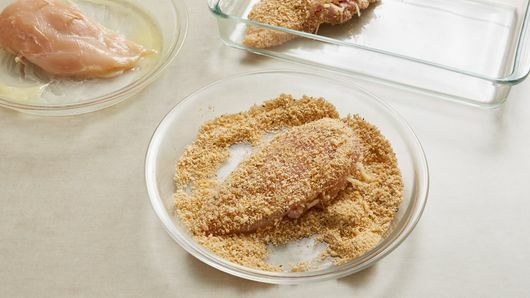 Sprinkle any remaining bread crumbs over chicken. Bake 28 to 32 minutes or until juice of chicken is clear when center of thickest part is cut (at least 165°F). Remove toothpicks before serving. 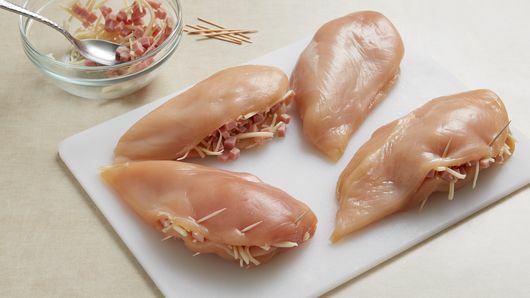 You can stuff 1 to 2 thin slices of deli ham in the pocket of each chicken breast in place of the chopped ham. To quickly melt butter, cover and microwave on High about 30 seconds. In French, “cordon bleu” translates to “blue ribbon” in English, and believe it or not, this term dates all the way back to 16th century France, according to Smithsonian. An order of knights that were created by King Henry III of France wore blue ribbons with the cross of the Holy Spirit attached. Large feasts were held for these knights, and the food served was of the highest quality for the prestigious group—it’s thought that the term “cordon bleu” then became associated not only with the knights, but also with the food served at their dinners. 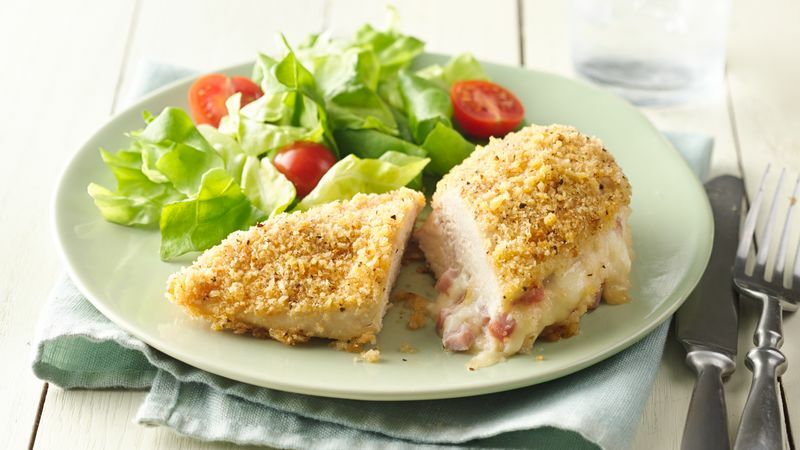 Chicken cordon bleu nowadays is a type of stuffed chicken breast. The common fillings are ham and cheese (often Swiss cheese). This dish can be baked in the oven or cooked on the stove. This easy five-ingredient recipe is baked in the oven and is stuffed with the classic cordon bleu ingredients, and to make it even better, is rolled in a panko bread crumb mixture for a tasty, crunchy finishing touch. Stuffing chicken breasts with ham and Swiss is just the beginning. Thanks to chicken breasts’ versatility, you can prepare them in seemingly endless different ways! Browse all of our easy chicken breast recipes and see for yourself.